I'm coming up on a year of eating from the box, and I truly thought there would be no more surprises. We have been through all four seasons. What else could those farmers possibly pull out of their fields? 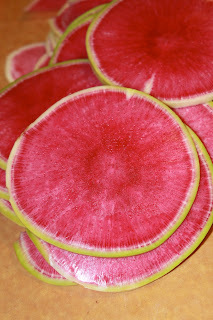 The watermelon radish, it turns out. It is named because of it's amazing coloring... greenish on the outside, and a beautiful red inside flesh. This radish, although huge, is surprisingly sweet. 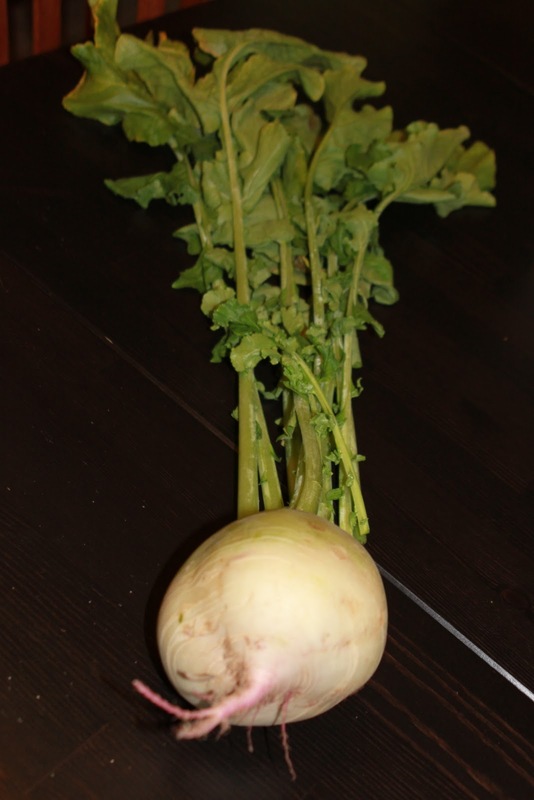 Of course, it still tastes radish-y, but not as peppery as many other kinds. It is about the size of a softball, and with a very long set of greens, it is an imposing presence. Especially since it crashed the party. How would you feel if you met this guy before your morning cup of coffee? Not knowing what to do with this behemoth, I went a google-ing, and found a salad recipe at "Healthy, Happy, LIfe" I am not sure I am going to recommend you all go buy a watermelon radish just to try this, unless you happen to be a radish lover. I'm not even sure you could go buy a watermelon radish. Do they actually sell these? But, if you happen to get one in your own box of produce, this is a nice, fresh, sweet and tart salad that goes nicely with chicken, potatoes, beef, etc. I have to admit that, since I am leaving for the weekend, I am in a bit of a rush to get all the veggies cooked and eaten early this week. I didn't experiment at all with this recipe, or change a thing.